There are a million and one dog beds to choose from, but if your dog is a chewer, your choices are a little more limited. Which is why we’ve compiled a list of our favorite most tough dog beds and what makes a good, indestructible, chew proof dog bed. Having tested and reviewed a number of pet beds, including many chew-proof beds, our editors and their dogs have found which ones survive better. If you scroll lower, you'll see a full list of 50 best tough dog beds from most indestructible to least. We've also picked our favorite top five best tough dog beds and tips on what makes a long-lasting and indestructible dog bed for you to make your own picks. * Click on the best tough dog bed brand for more information and prices, or scroll below for more options, reviews and details. What Makes the Best Tough Dog Bed? Dog beds will take on damage as a result of more than just chewing, so it doesn’t matter if your canine is a puppy or an adult dog. After several months (years, if you're lucky) of use the bottom of a pet bed will receive its fair share of wear and tear. To ensure that the product you’re spending money on is able to withstand the test of time, take the extra precaution of purchasing an outer lining or encasement. Generally, outer lining or encasement of truly tough dog beds come in plastic or vinyl, and usually go around the inner filling of the dog bed. Then, if it does get wet or start to smell bad you can easily unzip the lining, remove it, and place it in your washing machine. While a lining will make a huge difference in the durability of tough dog beds, the material itself should have some type of water resistant properties. Whether your pet is housebroken or not, there are going to be times when they have wet paws or salivate heavily from playing outdoors. Lighter materials with a plush cotton feel may start off comfortable for your pet, but after months of use they start to acquire an unpleasant scent. They definitely aren’t the greatest for moisture resistance, and tend to fall apart when placed in a washing machine. Another important factor of tough dog beds (other than not flattening) is how well do they sustain damage from the dog. Fabrics such as canvas and Cordura are exceedingly strong, and are generally preferable for dog owners who are worried about chewing. The main issue with chewing dog beds, especially in younger dogs like puppies, is that they like to tear things into little bits and pieces; then, they like to swallow it up, which is obviously dangerous. This is often the case with loose, cotton fiber stuffing as well. Besides canvas and Cordura, other options included in best tough dog beds for their chew resistance are ballistic nylon (also known as 1680D), and denim. Ballistic nylon is probably the strongest out of all the other options considering that it’s basically the same material strong backpacks are made from. 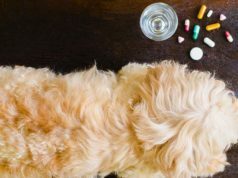 This is usually another major deciding factor in tough dog beds for many pet owners, and generally comes down to your dog’s physical needs and their overall behavior. Loose filling is cheap, but it’s not exactly the number one option for canine joint health or for chew proofing. If your pup does manage to rip it open, the cleanup definitely won’t be convenient. 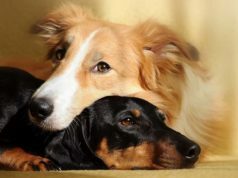 Surprisingly, some cooling dog beds that contain reliable cooling gel pads are quite popular among senior pet owners and owners who have dogs with issues like hip dysplasia and other disabilities. They’re also incredibly durable and long lasting, even against playful puppies, and often used for tough dog beds. 5. Is it Machine Washable? This is sometimes tricky, as many dog beds have the deceiving look of being machine washable. If you’re wrong though, it could run your dog’s bed and your very expensive, difficult to replace washing machine. Pay attention to manufacturer's notes and dog bed's product page for “machine washable” note. As far as dryers go, it’s best to let tough dog beds air dry by hanging them outdoors, or you can use an actual hair dryer if you’d like to speed up the process. Otherwise, avoid putting tough dog beds inside of your actual machine dryer – should the bed carry a funky smell or have special velcro flaps for a secure fit, the smell will permeate through the rest of your laundry loads and most likely ruin the velcro. Like with most pet products, hand washing tough dog beds is usually the best option. Every now and then though it is completely understandable to want to give a used up dog bed a good run through the wash. Again, make sure that it is clearly stated on the box or label that the product you’re getting is able to be put into a washing machine; otherwise, you'll just lose your investment. Elevated PVC dog beds are considered the most indestructible and chew-proof. Widely used in shelters, rescue groups, dog daycares and boarding facilities, elevated “pipe” beds are the best option available for a truly tough dog bed. The sturdy PVC material used for the legs and frame are virtually chew proof and structurally sound. The actual bed is made with a vinyl mesh, or one solid sheet of vinyl pulled taught. In addition to being incredibly tough, elevated dog beds provide pressure relief to the hips and airflow to keep dogs cool. PVC beds are also incredibly easy to keep clean: just pull it outside, scrub it down with soap and water, hose it off, and then wait for it to dry. The mesh variety may take 30 minutes to an hour to dry out since water gets trapped between the weaving as you scrub it down. Aluminum is another option for pet owners who wish to avoid plastic. The only real downside to mesh on tough dog beds is that the center does tend to slowly give in to the weight of the dog, creating a droop in the middle of the bed. Aside from the minor drooping, elevated beds are especially helpful to large breed dogs who need a little more support; however, some dogs don't like being elevated. Below you will see a number of great options for a truly tough dog bed, but it's important that you consider all the factors mentioned above as well as your own home situation and dog's current age, size and health. Let me explain two different tough dog bed examples and how to best choose one for you. The reason Big Barker Dog Bed is the number one pick on our list of top favorite tough dog beds (after we've tested it for weeks) is because it's backed by a 10 year warranty, and has also been highly recommended by dog owners who struggle to find a strong enough bed for their pet (especially large dogs). It runs from medium to extra large sizes, and has an additional polyester outer casing to protect against chewing and moisture. It’s also weighted, making it far more difficult for younger pops to drag it across the floor in an attempt to tear it apart. The Kuranda Dog Bed, our second pick, is an elevated PVC bed with all-aluminum frame and is the most tough dog bed you can find. It also happens to be a widely renowned item across the board. While it probably won’t match up with your furniture and isn't the most comfy bed out there, this bed is both extremely chew-proof and easy to clean. If you want to give it a more “homey” feel, get a soft blanket and drape it over the top. Although it is a rather basic bed, if your dog does decide to make it his mission to destroy the Kuranda dog bed and is somehow successful, the cleanup is far less of a hassle. Since it doesn’t come with stuffing, it greatly reduces the chances of your dog swallowing something they won’t be able to poop out. Tough dog beds aren’t always 100% chew-proof beds and will have some material available for a strong chewer to eventually tear into. But, sometimes they are pet beds that can remain supportive even with constant use and will not flatten. The Big Barker Pillow Top Orthopedic bed is one of those beds that have a great balance between being relatively resistant to chewers (but not chew-proof) and the one that will never flatten, even with large dogs' weight. In fact, if you've watched/read our review, you know this dog bed is made specifically for giant breeds – something you don’t see too often – and the taut cover is a little more difficult for chewers to get their teeth into. Be prepared to pay big bucks for this line of beds, but they come with a 10-year warranty and a money back guarantee if the foam doesn’t keep its shape and loft for 10 years. This is a great choice for your older dogs who need joint support, but we don’t recommend it for dogs with incontinence concerns since the foam can hold odor. One of the most recognized names among tough dog beds when it comes to specifically chew-proof and indestructible options is Kuranda. These tough dog beds are so durable that they’re often used in shelters to keep homeless pups off the cold floors. Kuranda has a range of bed options, but the chew proof all aluminum is your best bet for aggressive chewers. We like how light this bed is even though it can support up to 250lbs. and that the bed is covered by a 1-year warranty. What we like most about this bed, however, is that it’s both supportive and easy to clean! If the aluminum finish isn’t your thing, don’t panic, because Kuranda also has a PVC chew proof bed available too. Similar to the Kuranda and Coolaroo tough dog beds, the K9 Ballistics raised dog bed has an aluminum frame and the fabric top is made from chew proof ballistic material. If you have a dog who can chew through just about anything, this bed is worth the investment. The fabric is both supportive and has rip-stop tech so that if your dog does manage to puncture it with a nail or tooth, the hole will get no larger. This isn’t the prettiest dog bed out there and it doesn’t look half as comfortable as those cushy beds, but it is supportive and can withstand even your most voracious chewer’s boredom. This cooling foam orthopedic gel dog bed is durable in that the thick foam mattress is long-lasting and won’t flatten with even the largest breed of dog. The cover of the bed is also made from ballistic material, so it can stand up to scratching and minimal chewers. Unlike some of the other orthopedic beds on our list, this one is waterproof which makes it perfect for seniors too. What we love most about these beds, though, is the full range of sizes that they offer and you can have your pick of colors too! Although it’s more of a bed designed for camping, this elevated cot for dogs is also an ideal solution for your chewers that can’t be trusted with a traditional pillow pet bed. We love that the sturdy steel frame of the bed is foldable and that the bed is strong enough to hold up to 100lbs. We also love that the surface is simple to clean, but it does lack something in the cozy department! This Coolaroo cot dog bed is the type of Kuranda dog bed on the cheap. It's very affordable, breathable, and washable and it keeps your pup off the ground and away from cold drafts. This is a lightweight bed, and it's not as sturdy as Kuranda tough dog beds, but it gives your dog few areas to chew since the frame is made from steel and the fabric of the bed is pulled taut. We don’t recommend this bed for older dogs since it can be a bit slippery. We should also mention that this bed is a bit tricky to put together (seriously, you’ll need a second pair of hands), but for the price, it’s a great option for chewers! A unique looking dog bed, this lounger makes our list of favorite tough dog beds because its shape makes it difficult for dogs to chew. This isn’t your traditional cushy bed, but it does have some give and is very supportive. We love the raised ends on this bed that serve as pillows for your dogs who love to lean and we also like that the various sizes of bed (small through jumbo) are available in nine different colors! Oh, and did we mention that the largest of sizes (45” x 30”) is only $43.99? This isn't a bed for your home per se, but if your dog travels with a seatbelt restraint in the cargo area of your SUV then the Backseat Barker is a must. After we've tested the bed, we found that the easy to clean cover of these unique tough dog beds, while sturdy, isn’t ideal for very strong chewers, but the comfort foam of the bed is perfect for shock absorption and will stand to the test of time. We can’t say enough about how much we love the design of this dog bed (but you can check our review) and the fact that it keeps your dog comfortable and fully protected against bumps in the road! This is one of those tough dog beds that won’t stand up to your aggressive chewers, but the orthopedic foam will stand up to regular use and will not let the bed flatten. What we really love about this bed is that the bolsters are tall enough for support but not so high that they lose their structure and flop over after a few months of use. Another great perk is that this bed comes with a 1-year warranty and a 100% satisfaction guarantee so, what do you have to lose? When it comes to durable dog beds, Orvis has one of the best selections you can find but they're also more expensive. In fact, this cozy bolster dog bed is comfy enough for you to lie on it with your pup and fall asleep. This bed is made with “tough chew” material which will stand up to your average level of tomfoolery by a chewer and as an added bonus, you can get your dog’s name embroidered on the bed for free. What we love most, though, is that the cover is completely removable so you can always keep it clean! Another pick from K9 Ballistics, this is the perfect dog bed for your medium sized heavy build dog who has trouble with the foam on their beds flattening over time. This isn’t a chew-proof bed, but the 5” thick orthopedic mattress is going to stand up to a lot of use without flattening. In fact, the foam is guaranteed against flattening for 10-years which, if you have any experience with dog beds, is pretty incredible! Our next favorite feature? It has to be the faux fur fluffy sleeping surface! This tough dog bed is supportive and waterproof but definitely not one for your chewers. The bolsters are just too appealing for those destructive pups! The washable fabric cover is durable, but our favorite feature of this bed is the contour-balanced foam base that has undergone a ridiculous number of quality and durability tests. This is our favorite pick for senior dogs who need that extra boost of support. Another great pick for senior dogs who need that additional support for their joints, this tough dog bed is made from shredded memory foam with a waterproof removable cover. The heavy-duty zipper isn’t in a prime location for chewing, but this still isn’t a great choice for moderate to aggressive chewers. We love that this bed comes with a one-year money back guarantee and that 10% of every purchase goes to the humane society! Blueberry is a brand we have trusted for dog collars for a while, but we never even knew that they made tough dog beds until we ran across this one. That said, we’re torn on whether or not to include this bed on our list because it stands up to your denning and scratching dogs, but it’s definitely not for your aggressive chewers. Plus, there is also something that’s definitely missing when you compare this option to some of the others on our list. We think this would be a better choice for your smaller pups who prefer to have a bed on the couch rather than the floor. 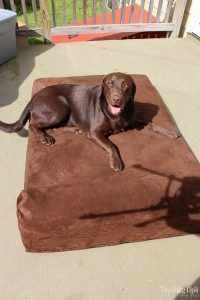 The second “mat style” bed on our list of best tough dog beds, we love this one by HeroDog because it’s a single solution for a variety of sleeping arrangements. If your dog is crated, it’s perfect as a crate pad, if they use a cot, it fits nicely on top of a cot (and it’s non-slip), and if you prefer, you can simply use the mat as a bed! The quilted top is durable enough for denning dogs, but we don’t recommend this one for chewers! This is another elevated cot bed for dogs (and can be tricky to put together, so get some help!) that’s great for chewers because there’s just nothing to chew on! The steel frame is sturdy and the fabric seems to be able to hold a heavier load than some of the other cot beds on our list. While the manufacturer says this bed can be taken apart easily for travel, we disagree, but it’s still a durable investment that can be used indoors and out. The Qz right angle bolster dog bed is another option that’s great for moderate chewers. The bolsters provide plenty of support while the fabric cover is durable enough to resist punctures. The orthopedic foam provides a fairly supportive base, although we would like to see a little more padding. Our friends at K9 Ballistics are back with another durable dog bed with a thick and supportive polyester mattress. We love that this bed has built-in channels to keep the mattress fill in place and we also love that the bed is quite deep compared to similar beds of the same length. We aren’t thrilled with the bolsters that tend to lose structure over time and this isn’t for your chewers, but it’s a supportive non-foam option for those of you who dislike how well foam holds odor. This heavy duty dog bed is not for chewers, but it is supportive and resistant to mold and mildew which makes it a tough bed in our books! The industrial zipper will hold up to plenty of washing, and the waterproof liner that comes with the bed is a great addition for older dogs or special needs pups. While we like the sturdy bolsters on this bed, what we love most is that additional covers can be purchased separately so you don’t have to replace the bed when the cover does get worn. Made from eco-friendly polyester, this pet bed is another mat option that is best suited as a crate pad. The fabric is chew resistant and water resistant but it can also be washed which isn’t something you see too often with crate pads or mats. We love how durable this bed is, although it is lacking a little in cozy appeal. That said, few chew-resistant options are going to be as plush as the less durable options. Better suited to small dogs, this chew-resistant bed is ideal for cuddlers and dogs who like to curl in a ball when sleeping. The pet bed itself isn’t very large, but it is something different when it comes to durable beds. The cover is easily washed and we like that the bed is separated into two parts so the filling doesn’t shift. We just wish that this bed came in larger sizes! The canvas and fleece cover on this dog bed make it comfortable yet durable, but our favorite feature is the oversized bolsters that provide plenty of support for leaners! The cover is made to last and is waterproof, but in case you have any doubts, it’s also covered with a 1-year warranty. We love the structure of this bed, but we do wish that it was available in larger sizes for our bigger pups! Another K9 Ballistics selection, this is one of the sturdier dog beds in their product selection. Made with ripstop ballistic fabric, this is a bed that can stand up to indoor and outdoor use and hold up against your rougher chewers. Our favorite thing about this bed, though, is that it comes in a nice range of sizes, the largest bed measuring 40” x 68”! If your dog likes to curl up when they sleep, den, or snuggle, it can be hard to find a dog bed that will stand up to any amount of chewing. While this bed is only approved for light chewers, it’s one of the few den choices out there that can stand up to any amount of mouthing! The ripstop ballistic fabric does make this a less cozy option, but we challenge you to find a cozy yet durable denning bed. Snoozer is a brand that we trust and love and their super orthopedic lounge dog bed is a great example of why. Built with senior dogs in mind, this bed has an exceptionally thick and supportive foam base and a waterproof removable cover. This isn’t a bed for your chewers, but it is a great solution for heavier dogs who have trouble with the foam in their bed flattening over time. We’re not sure that this dog bed belongs on our list because it’s a sleeping bag, but because it’s durable and from a reliable brand, we made an exception. Perfect for camping trips, the outer shell of the sleeping bag is made from durable polyester that is simple to clean and resistant to water. You don’t have to be a camper to get use out of this durable sleeping bag, though, it’s a great waterproof solution to pups who have incontinence concerns. Another solid choice from Orvis is this memory foam couch bed for dogs that provides plenty of support for older dogs. The microfiber cover isn’t recommended for chewers, but the foam base of the bed is durable enough to last your dog a lifetime. We also can’t help but love that you can personalize this bed with your dog’s name embroidered across the bottom! Built with larger and heavier dogs in mind, this waterproof bolster bed has a 7” thick slab of foam to support your pup (you won’t see more than 5” in most foam beds). We love that this bed comes with two covers – an internal waterproof cover and a soft outer cover – but we don’t recommend it for chewers just because there are too many places for nibbling! This tough dog bed falls into multiple categories of “durable” even though it doesn’t look all that tough. The bed itself is guaranteed by the manufacturer against any dog damage, but what we like most is that the fabric cover is antimicrobial and removable. In addition to the durable main cover, this bed also has an interior liner for added durability. This isn’t the thickest bed, however, so we recommend using it as a crate pad or as a topper on your dog’s cot bed. Highly recommended by pet parents, this durable pet bed has a corduroy fabric on the top to protect against scratching and denning. The cover is completely removable for washing and while the bolsters lack structure, they still provide plenty of support for your dog’s head. The orthopedic foam base is nicely supportive but it could use just a little more foam if we had to find a fault. Handmade from bamboo, this durable pet bed is only for your smallest dogs, but it’s a unique bed option that looks great with any décor. We love this bed for dogs who need a little added security while sleeping and if you have a cat, they will surely appreciate this bed too. The interior velvet cushion does provide temptation for chewers, but the shell of the bed will uphold for just as long as you care to keep it around. The polyester cover on this dog bed makes it durable enough for denners and scratchers while the soft surface is perfect for cozy sleeping. We like that the filling of this bed is hypoallergenic so if you have an allergy pup like a certain Labrador we know, then this is a good option. The cover of the bed is completely removable, but what we love most is that it features probiotic technology for continuous odor control which is a huge plus for any dog parent! Not for chewers, this dog bed finds it’s durability in the “cool action” memory foam that supports your dog without flattening over time. The backrest and side bolsters are one of our favorite features of this bed simply because they’re so high that they provide added support for leaners. There is also the fact that this bed comes from one of the leading mattress manufacturers for humans, that has to say something for the quality! A gel-infused memory foam dog bed, this is another foam bed that will retain its support and structure over time. The removable cover is completely washable, waterproof and comfortably plush. This bed also comes with a satisfaction guarantee which is always nice to have, but we don’t think you’ll be trading this one in. Brentwood Home isn’t a brand we’d heard of before and they’re certainly pricey, but once you try their tough dog beds, you won’t want to try any other brand. The waterproof gel memory foam is sturdy yet supportive and the bed cover is removable for washing. A waterproof liner protects against spills and the mattress itself is guaranteed with a 3-year warranty and is resistant to dust mites, mold, and bacteria! Not only is this dog bed made with gel memory foam that won’t flatten, the cover of the bed is also exceptionally durable. We love that this bed has channels to evenly distribute the gel foam and that the shape of the bed creates a cuddling feeling for your dog as they sleep. We still don’t recommend this bed for chewers, but it is a nice selection for support of your middle-aged dogs with joint concerns. Highly rated by pet parents everywhere, this tough dog bed combines the durability and comfort of an elevated cot with the support of a bolster bed. Unfortunately, the addition of bolsters makes this a sketchy choice for chewers, but the bed frame and top fabric are exceptionally durable. We like that the bolsters on this bed can be removed because it allows you to accommodate chewers who lose interest in chewing as they age. Another sturdy pet bed choice from Sealy, this bed was built for support with gel foam that doesn’t flatten and supportive walls on all sides. The cover of this bed is completely removable and washable. What we love most about this bed, though, is that it incorporates a charcoal base designed to absorb odors and pull them away from your dog. 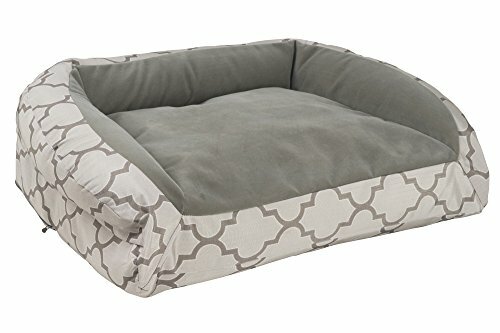 Another mat-style dog bed, this waterproof bed is easy to clean, easy to travel with, resistant to puncture, and has seams that stand up to the test of time. We love the individual channels sewn into the bed that keep the stuffing from shifting. This is a good choice as a crate liner for dogs with incontinence concerns, but we should warn you that it does lack padding so you may want to invest in a couple! Pricey, particularly for the Furhaven brand, this giant-sized dog bed is not recommended for chewers, but does offer durable non-toxic foam support. The zippered cover is removable and washable and if you find traditional bed bolsters to be too high for your pup, then you’ll be happy with these low-profile bolsters. We also can’t help but love the sheer size of this bed and the soft faux fur surface on this bed. You’ve probably heard of the Casper bed for people, well, now there’s a Casper bed for dogs too. Made with a durable fabric, this memory foam bed comes at a price, but if it’s anything like the human version, it’s worth the investment. We really love the all-around bolsters of this bed with the sunken middle because it’s perfect for our resident “curler” who always sleeps nose to tail. Another Orvis tough dog bed, this one too has the “tough chew” cover for your mild to moderate chewers, but unlike the bed above, this is just a platform bed with no bolsters. We love that even though the bed is made from a chew-resistant material, they have also incorporated softness to make the surface of the bed perfect for sleeping on. This is a “comfort fill” bed, meaning that the stuffing may shift slightly, but the overall quality of this bed is above and beyond your average pet store brand bed. K9 Ballistics is another big name to consider when you’re shopping for a durable dog bed. This bolstered “nesting bed” is one of our favorite picks because it is durable but it also has a velvet texture making it perfect for your snugglers. We also love the smaller bolsters around the bed that provide head support. The only negative comment we have about this bed is that the side bolsters don’t hold up as well over time as the main bed pad does, they tend to flatten. Aside from having the cutest logo ever, this HuggleHounds chew resistant bed is one durable bed and can withstand chewers as well as spills and accidents. The waterproof cover is actually guaranteed so if you find that it doesn’t meet your expectations or gets a hole in it, they will replace it free of charge. There isn’t too much you could consider “special” about the design of this bed, but the fabric durability is enough reason to pick this one up for your chewer. The SnoozeSofa is a cot style dog bed with memory foam inside the main pad and rounded bolsters on the sides and back. We like the unique design of this bed overall. This isn’t ideal for your chewers since the rounded bolsters are perfect for chewing, but the design of the bed does make it very durable. The only thing we don’t like about this bed is that it only comes in one size – 37” x 25”. If you’re looking for a chew resistant dog crate mat rather than a traditional bed, this crate pad is a great solution. We love the small lip on all four sides that protect your pup’s nails from slipping through the bars of their crate, and we also love that this is a washable bed! You can grab this pad in various sizes, but this pad measures 21” x 30” and is 3” high and it’s rated for indoor and outdoor use! Although it looks somewhat peculiar, this dog bed is a good option for your tough pups. The quilted cover is soft to sleep on and can be removed for easy washing, but the bed itself is made from durable memory foam. The shape of this bed makes it hard to chew and the non-skid base is a definite plus for your bigger pups. What we love most about this bed is the slightly raised lip that supports your dog’s head when sleeping! Ruffwear is a brand we love for just about everything and their Restcycle tough dog beds are no exception. This is more of a traditional cushion style bed and is made from unused foam discarded after the backpack manufacturing process! While the top of the bed is soft (microsuede), the pillow topped mattress is still very durable and waterproof! The one thing we don’t care for on this bed is that it’s a little thin for your heavier pups, but it’s still a great and durable buy. This memory foam orthopedic tough dog beds might not be anything fancy but we had to mention it because they only use certified non-toxic foam that doesn’t contain formaldehyde, BPA, or PVC. With medical grade foam, this bed offers plenty of joint support and the waterproof cover and industrial strength zipper mean that it can stand up to even the heaviest sleepers! What we like most about this bed, in addition to the fact that they use non-toxic foam, is that their foam molds to your dog’s body rather than sinking completely. This may not be the most visually appealing of tough dog beds, but it’s one of the only innerspring dog beds still on the market and we love it! Innerspring beds provide added joint support that’s great for seniors and they don’t collect dust mites. This is a bed that will stand up to use for a good four to five years without sagging and the washable cover ensures that it stays clean for that lifetime.